The recent floods and mudslides in some major cities in Cameroon and a fall in honey production have been blamed on climate change by local environment campaigners. The outbursts of heavy rains caused floods and mudslides that killed at least five persons destroying property in Limbe in the South West Region of Cameroon. In Douala, in the Littoral, homes were flooded and traffic blocked while hundreds were rendered homeless in Maroua in the Far North of Cameroon. Before the heavy rains, most parts of Cameroon experienced an unusually dry weather during the months of May, June and early July 2018. These floods and mudslides that rendered many city dwellers homeless followed serious flooding in central town Yaounde, the political capital of Cameroon. Floods and mudslides have occurred before but not widespread within a few days like in 2018. Local environmentalists as well as bee farmers who have recorded their worst honey harvests in a decade following a progressive drop in recent years have blamed climatic changes for the mishaps. “Three corpses were pulled out of this mud and rubble, we rescued other young people by pulling them alive but the actual amount of people that perished here in Mbonjo (Limbe) may never be known”, Madame Gladys Enoh, a middle aged inhabitant of Mbonjo village in Limbe South West region where many people lost their lives said. Speaking three days after torrential rains caused floods in Limbe Down beach, some inhabitants of the hillside village of Mbonjo where all the trees have been replaced by houses, regretted that the exact number of deaths may never be known given that when the first mudslide swept away three persons in their home, the population started digging to rescue the victims but behold, more mud rushed down from the stiff area and swept more people. Local administrative officials led by South West governor, Mr Bernard Okalia Bilai have ordered the resettlement of citizens in the disaster area. After the 24th July mudslide and flooding in Limbe, citizens were left perplexed as inhabitants could be seen drying mattresses and other household equipment pulled out from the mud. Two days after the Limbe mudslides, it was the turn of the city of Maroua in the Far North Region. According to local journalists in the area, many were left stranded after their homes and equipment were swept away. Earlier, on 22nd July, Douala in the Littoral was hit by floods with water entering homes living many stranded especially around Bonaberi. 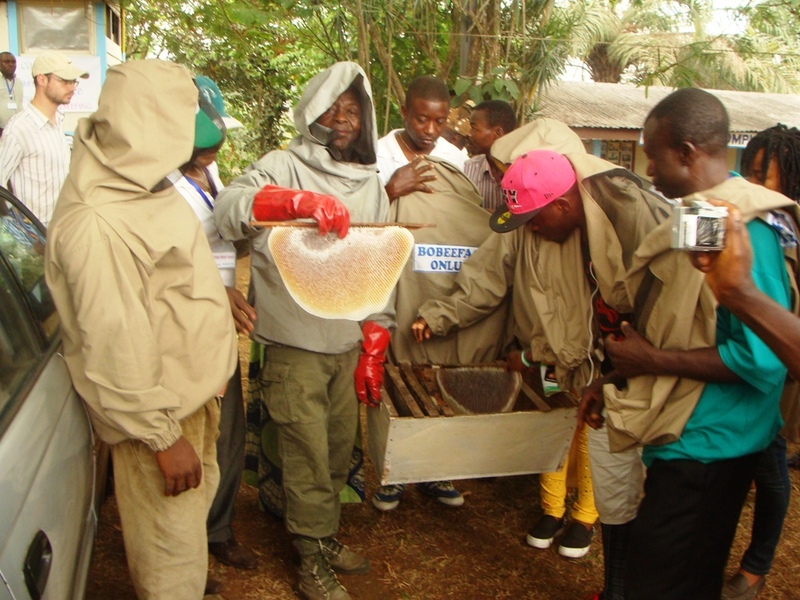 Honey production and other bee farming by-products are major income sources to some communities like Oku in Cameroon. But in the last three years, bee farmers say, honey production has dropped drastically leading to substantial loss in income. Leading honey producers, like the Oku Honey Cooperative in the North West region, a certified white honey producer regretted that their income in 2017 dropped by almost 65% causing widespread poverty among farmers. The bee farmers blame their bad business on heavy rains at wrong periods that disturbed flowering of the plants from where bees get nectar. “The situation is pathetic, with the drastic fall last year, many farmers hoped to improve production but the changing climate this year has worsen things for us”, Mr Shang Peter, one of the marketing managers of Oku White Honey in Bamenda told us. 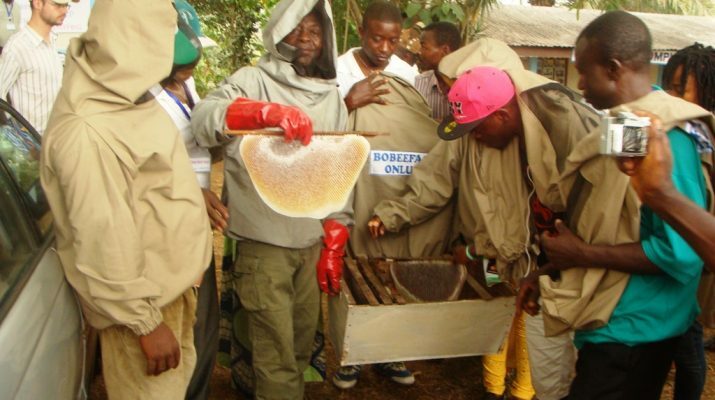 Similarly, Mr Lyonga Mbake Samuel, a seasoned bee farmer and coordinator of the Bonakanda Bova Bee Farmers Cooperative in Buea said honey production has dropped because of the adverse climatic changes. According to the experienced bee farmer, trainer and environmental activist, things may get worse for bees and local bee farmers. The bee farmer said Cameroon bee farmers must develop adaptation strategies to improve honey production. To him, there is a need to resort to planting bee-friendly plants in and around apiaries to provide food for bees and fight climate change, deforestation and global warming. Bee farmers, to him, should even resort to feeding bees so that they don’t waste all their time flying long distances to look for nectar. Lyonga Mumbe William, another environment campaigner and bee farming trainer in Buea told us that things may get worst if the rampant use of pesticides, felling of trees, bush fires and other unfriendly environmental practices are not abandoned. “After killing all the bees, farmers will now realize that even their food production will be affected because the bees do marvelous work in fertilizing crops in their hunt for nectar”, Mr Mumbe, the Coordinator of FAAFNET, a Buea based environmental civil society organization regretted. The mudslides in Mbonjo, Limbe have been linked to deforestation, the hilly nature of the area that has loose and volcanic soils. “Mbonjo, a hilly area was a forest and the trees were all felled exposing the soil to more run off and mudslides, it’s regrettable that this deforestation that contributes to global warming, climate change and hazards like floods, mudslides and drop in food production is taken lightly by the population”, Pa Ndumbe Stephen, Director of WEWULEY Consultancy, an environmental campaigner said. 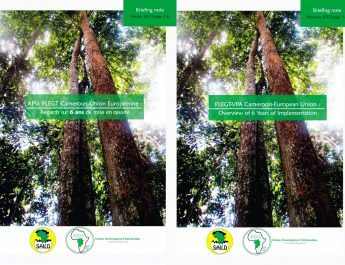 Bushfires, deforestation and other bad environmental practices have deepened the effects of climatic change and desertification in Cameroon, other researchers have affirmed insisting on the need for sustained education of the local population. 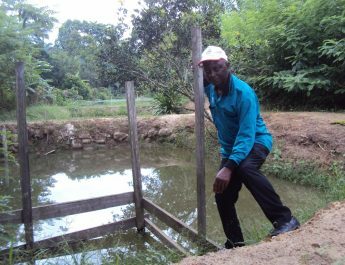 The environment campaigner, like many others regretted that despite sensitization many farmers still shoot themselves on the leg with bad environmental practices that reduce the number of bees and subsequently crop production. Ndumbe Stephen advised that re-forestation will reduce incidences of floods and mudslides while bee friendly plants and less use of pesticides will greatly increase the bee population and honey production. Researchers say warmer world temperatures due to human activities is the cause of heavier rains witnessed in recent years given that oceans let off more evaporation and more moisture is held in the atmosphere, thus heavier rains.